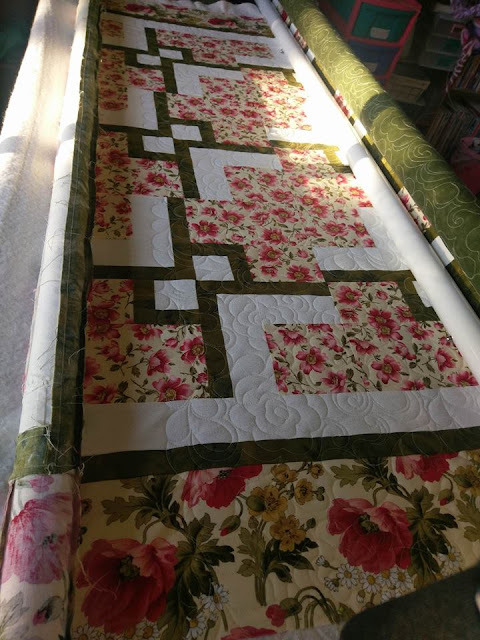 Today I am working on this lovely quilt by my customer, Wendy. I'm using an edge to edge design called feathered roses. 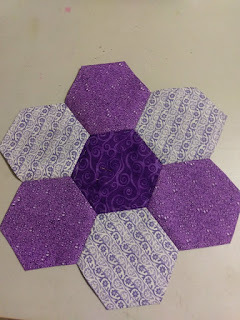 my latest hexagon for my hexe quilt is blue and I finished it while waiting for my daughter at TAFE. I always get asked what I'm sewing when I take my work into public places...do you? My lovely customer Rhonda is a prolific sewer. 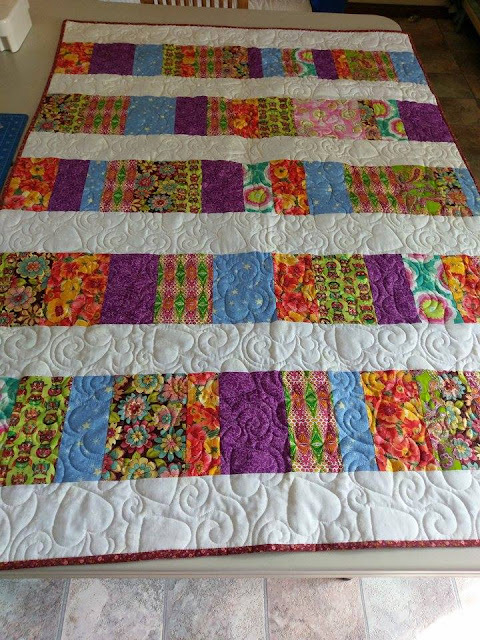 I just finished quilting this for her. She calls this a small quilt. it's 80 inches wide. And it is reversible. 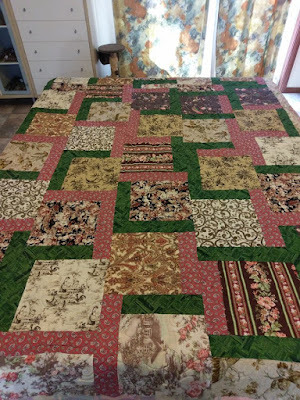 The interior is an old woollen blanket which makes this quilt super warm and super heavy. June 26th is my wedding anniversary. My husband has been asking for a new supporters quilt. His old one is looking very tired. So my goal for June is to turn this bundle of fabric into an Essendon (AFL) quilt. I plan to use the bomber plane emblem as a large applique (satin stitched on the machine) ...probably with the red as the background. I hope I can get it done as I would like it to be a surprise, so i can't work on it while he is at home. Wish me luck. And I also did another (double) page in my scrapbook while my stuff was all over the kitchen table. Not feeling the best today. I often feel a bit yuck on Sundays as I take my nuclear medicine on Sunday nights. The beautiful lady in the centre is referenced from a birthday card, then I looked up art deco style lettering and patterns to create the rest of the colouring page. I hope the rest of the week is as productive. Once a moth I get together with some of my friends for a scrapbook night. We don't always scrapbook. Sometimes one of us will bring colouring in to do, or stitching, or whatever we feel like. We met at my house tonight, so I've left the mess out until tomorrow. I only managed to make 3 pages. My friend Nicole created 5 double pages! Here are the pages I made. I've started a new album which begins with the birth of my daughter. I'm not the quickest or most creative scrapbooker in the world, but I have about 10 albums that i have finished to look back through and enjoy the photos and memories. 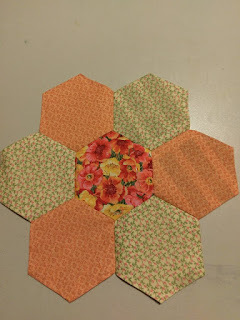 I'm currently sewing hexagon 'flowers' together to make a new quilt. The plan is to sew lots of different colour ways of this tri colour arrangement. I'm sewing them in rows and then spacing them with a row of white/ cream hexagons. I'm thinking i'll custom quilt it with feathers and other fun stuff. But that will depend on how my back feels at the time as custom quilting is seriously hard on my back. I get one of these flowers done every few days, so this is a slow process, even though they are large hexagons (three inch sides). 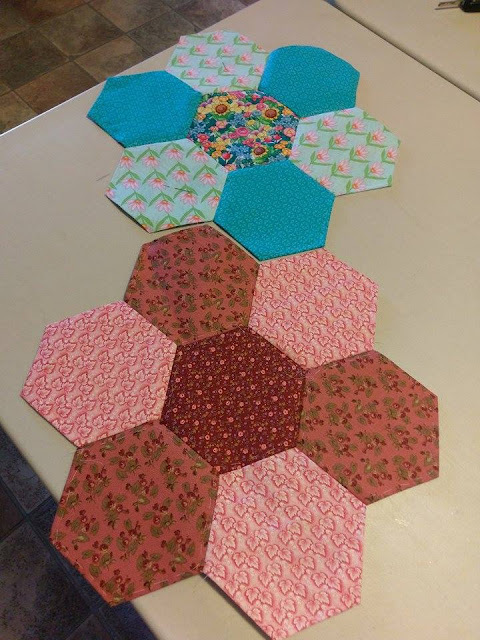 I don't think I will ever do one of those tiny "insanity" hexagon quilts. This suits me for now as I do it while having the TV on in the background (usually something like a cop show my husband is watching). This project will probably take a good few months to complete the top. I struggled for a long time as I kept bouncing between quilting, colouring, and art works. well recently I've had an epiphany! This is my blog and it should reflect me... not cater to an audience. And as I am constantly creatively scattered...so will be the content of my blog. 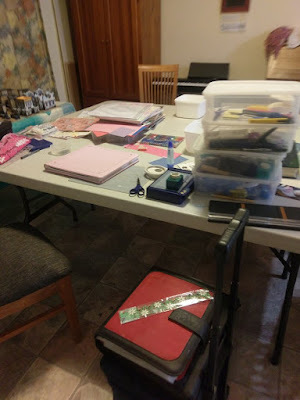 So I apologize if you only read quilting blogs, or only read mixed media blogs....or whatever. From now on I will blog about whatever I am doing. Over the weekend I finished a baby quilt for a lady at my husband's work whose baby shower is on Friday. It took 4 days to make. I'm pretty pleased with that. It wasn't tiny either. The pattern said crib sized, but I think it is too big for a cot. It is just a bit short on a single bed. But never mind. I'm sure the baby will enjoy rolling around on this on the floor looking at the bright colours.